Margot's having a rough few days with what looks like four new teeth coming in. Four! Teeth shift out and in, so we won't know for while how many are out for good. We'll try to document her new toothy smile when we're past the worst of it. 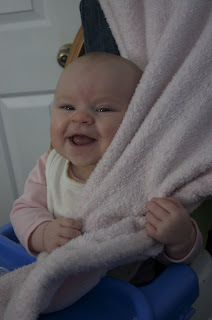 Here is a photo from the other day in which, if you look closely, you can see her existing two bottom teeth poking up. What an adorable smile! Hello, gorgeous!